Credit: NASA. Download this image (JPG, 177 KB). 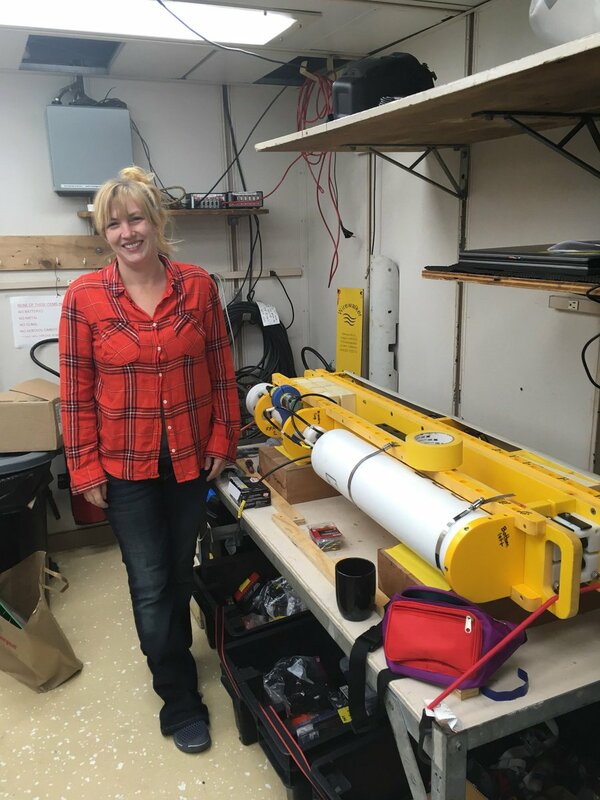 [09-Aug-18] Dr. Melissa Omand (University of Rhode Island) assembles a wirewalker, an autonomous platform that will be used to collect data on ocean physics, chemistry, and biology during the EXPORTS cruise. The wirewalker is a vertically profiling instrument package propelled by ocean waves. When attached to a cable, the motion of ocean waves "walks" the wirewalker to the bottom as it takes continuous samples in the water column. When it reaches the bottom of the path, a release is triggered that returns the package to the top of the line by using its own buoyancy. Typically, this round trip takes about ten minutes to complete and a wirewalker can make hundreds to thousands of profiles in a single deployment.